I had the opportunity recently to read some of Ronald Reagan’s personal diary from his White House days. I was struck by one very short sentence from April 20, 1982. It remains relevant today, and explains a lot about the differences between Republicans and Democrats. I find the line instructive both about O’Neill and his mindset, but equally about Reagan and his. 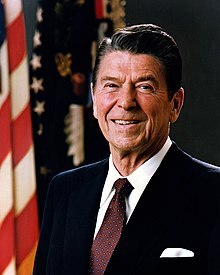 In this seemingly offhand observation, Ronald Reagan gives Tip O’Neill credit for acting in good faith in their policy disputes. O’Neill and the Democrats really do believe that Republican policies are intended to help the rich get richer. Forget for a moment that they’re wrong about that (as I’ll demonstrate below) and set aside the evidence from Reagan’s time and ours that shows unmistakably that our policies actually help the poor get richer. Just consider that Reagan recognizes O’Neill, however wrong, actually believed that Republican policies were explicitly designed to help the rich. The same remains true today. Democrats actually believe this stuff; they truly think that Republican policies are intended to help the rich become richer. And, of course, if you believe this of us, like O’Neill did and today’s Democrats still do, you would vigorously oppose and denounce our selfish, mean spirited “welfare for the rich” policies. But I note the passage from Reagan’s diary for another reason than just to explain Democrats. It really says eloquently that O’Neill and today’s fellow travelers with him are just plain wrong. That is actually the most telling point of the diary entry. Quite simply, Ronald Reagan knew that this absurd Democratic belief was not true. The diary entry is inexplicable otherwise. Note that Reagan did not say “O’Neill is on to me about our policies . . . .” He did not say, “Well, Old Tip finally figured us out . . . .” Instead, one can almost hear the incredulity in Reagan’s voice. There can be no other explanation of this diary comment. It only makes sense if Reagan saw it as saying something important about O’Neill: He actually does believe that nonsense. How silly of him. A simple sentence in a personal diary from a generation ago gives lie to the Democratic canard and still prevalent notion that the GOP is all about making the rich richer. Tip O’Neill might have believed that. But Ronald Reagan knew better.